Dove Holes is a village in the High Peak district of Derbyshire, England. It has a population of about 1,200 (2001) shown in the 2011 as being included in the population of Chapel-en-le-Frith. It straddles the A6 road approximately three miles north of Buxton and three miles south of Chapel-en-le-Frith. Trains run from Dove Holes railway station into Manchester. Residents of the village live either in the village or on outlying farms. There are around six farms in the village and many more within the boundaries of the parish. There are also large limestone quarries that, over the years, have made an important contribution to the development and economy of the village. Additionally, there are several businesses. There are two public houses, one of which offers accommodation. There is a daily milk delivery service and a mobile library every fortnight. There is a church, Methodist chapel and a community centre. The village lies on the fringe of the Peak District National Park. Evidence of human occupation at Dove Holes can be traced back to the Neolithic Period (late Stone Age) because of the existence of a henge, known locally as The Bull Ring, and an adjoining tumulus. In medieval times the area was used as the royal hunting Forest of High Peak (now known as Peak Forest), an area set aside as a royal hunting forest. The village's name is believed to derive from the Celtic word dwfr (dŵr in modern Welsh), which means water, hence Water Holes or Dove Holes. The same word is the origin of the name 'Dover' for the famous Channel ferryport. In 1650, a General Survey of the Manor of High Peak was made to assess the property of the late King Charles. This recorded that people were burning limestone around the village and that there were 14 kilns thereabouts, the burnt lime (quicklime) being slaked and used by farmers to condition the soil in their fields. At that time, lime kilns could be built and demolished without authority. With the coming of the Industrial Revolution, and the opening of the Peak Forest Tramway in 1796, the limestone quarries were commercialised. The first of these was at nearby Loads Knowl and others quickly followed along Dove Holes Dale. Undoubtedly, the opening of the Peak Forest Tramway and the consequent expansion of commercial limestone quarries contributed greatly to the expansion of the village. 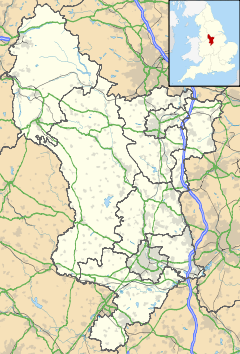 For the first time, there was an outlet for limestone in Manchester via the Peak Forest Tramway, Bugsworth Basin, the Peak Forest Canal and the Ashton Canal. There is a High Peak bus company garage on the east side of the A6, replacing the one which used to be in Buxton. In 2001, the village was voted the ugliest village in Britain in a Radio 5 Live poll. Cemex operate a quarry in Dove Holes. ^ "Village challenges 'ugly' tag". BBC News. 23 January 2002. Retrieved 4 April 2012.